We will NOT sell any swords to minors or to regions where live sword sale is prohibited by law. Please check the regional regulations of your country or area before placing any orders with us. It is your responsibility to make sure that purchase, shipping, and possession of such a weapon is legal. By purchasing any item sold by SBG Sword Store, the buyer expressly warrants that he/she is in compliance with all applicable Federal, State, and Local laws and regulations regarding the purchase, ownership, and use of the item. 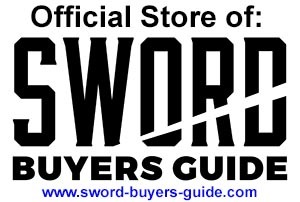 The buyer expressly agrees to indemnify and hold harmless SBG Sword Store for all claims resulting directly or indirectly from the purchase, ownership, or use of the items. The buyer expressly agrees to indemnify and hold harmless SBG Sword Store for all claims resulting directly or indirectly from the purchase, ownership, or use of the items in violation of applicable Federal, State and Local laws or regulation. Only when you are certain that you fully understand the contents of this guide and carry out its instructions should you practice usage of these weapons. If you have any doubts about your ability to handle or use these weapons safely, then you should seek supervised, professional help and instruction. Such personalized instruction is often available from local Dojo’s, and other self defense establishments. SAFETY MUST BE THE FIRST AND CONSTANT CONSIDERATION OF EVERY PERSON WHO HANDLES DANGEROUS WEAPONS. The person with these weapons in his or her possession has a full-time job. He or She cannot guess; he or she cannot forget. The user must know how to use this weapon safely. DO NOT USE ANY WEAPON WITHOUT A COMPLETE UNDERSTANDING OF ITS PARTICULAR CHARACTERISTICS AND SAFE USE. Safe weapon handling is YOUR personal responsibility. These and all weapons can cause serious injury and death. Safety MUST ALWAYS be the prime consideration of anyone who handles dangerous weapons. Always handle your weapon with full concentration towards safety, with and with respect. Use extreme care when withdrawing of sheathing your weapon. The cutting edge of the blade should always be facing away from you when drawing or sheathing your weapon. Make sure all bystanders are a safe distance away from you and the maximum extended reach or your weapon when the blade is unsheathed. WEAPON SAFETY IS YOUR RESPONSIBILITY. ALWAYS STORE (LOCK) WEAPONS IN A SAFE MANNER AWAY FROM UNAUTHORIZED HANDS. IF YOU ARE CONSIDERING CARRYING THESE OR ANY WEAPONS ON YOUR PERSON, FIRST CONSULT WITH LOCAL LAW ENFORCEMENT AUTHORITIES CONCERNING THE LAW REGARDING LAWFUL CARRY OF WEAPONS. ALWAYS ABIDE BY STATE AND FEDERAL LAW CONCERNING THE USE AND TRANSPORT OF WEAPONS. SWORD BUYERS GUIDE, will not be responsible for ANY alteration of ANY part of these weapons. Any changes made to this product are specifically contrary to our instructions and we expressly do NOT authorize any changes to be made. DO NOT JEOPARDIZE YOUR SAFETY OR THE SAFETY OF OTHERS BY MAKING MODIFICATIONS TO YOUR WEAPON. When using these weapons, be sure all persons are a maximum safe distance to the rear and out of the arc of the blade. When using this weapon always be certain that nothing – including either of your hands, legs or other body parts are in the cutting path of the blade.